The Competition and Consumer Protection Bill 2014 will also ‘modernise’ laws relating to media mergers. THE NATIONAL CONSUMER Agency and the Competition Authority will be merged to create “a powerful watchdog with real teeth acting to protect and vindicate consumers”, in proposals put forward by the government. The Competition and Consumer Protection Bill 2014 was published today by Jobs Minister Richard Bruton, who described it as “a major piece of reforming legislation”. He said that the new watchdog will be given “criminal investigation functions” to combat “serious white-collar crime and ultimately combat higher prices and protect consumers”. The newly-merged body, which will result in savings of about €170,000 annually, will comprise a chairperson and between two and six members. The Bill also seeks to regulate the grocery sector and ensure fairness between suppliers, retailers and consumers on issues such as contracts and delivery of goods. potentially a real inequality of arms between [suppliers and retailers] which can be abused in a manner that is not in the interests of jobs, consumers or sustainable safe food. He added that “new legal requirements for record-keeping and the inclusion of certain terms in written contracts together with strong enforcement powers” would ensure fairness and sustainability in the sector. 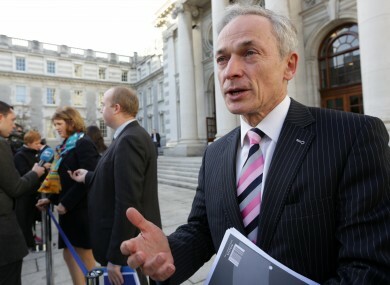 Following consultation with the advisory group established to examine media mergers, Bruton said the government has decided to retain “the basic model of current laws”, but “modernise these laws to reflect with international best practice … in line with the latest technological developments”. Diversity of content and diversity of ownership across the media remains an important part of a healthy democratic society. Responsibility for media mergers will be transferred from the Jobs Minister to the Communications Minister. This move was not recommended by the advisory group, but was secured by Bruton “given the substantial expertise on media matters that exists within the Department of Communications”. Explainer: How does a Bill become a law? Email “'A powerful watchdog with real teeth': Ireland to get a new consumer body”. Feedback on “'A powerful watchdog with real teeth': Ireland to get a new consumer body”.